She gets a given area for a chapter: screenwriting, characters, editing etc. It helps a lot to understand how a movie is created and what’s the role of the professionals around. She makes the fundamental points first, then illustrates them with examples. The author’s lexical knowledge is impressive, but she lists too many different examples. A movie could be made this way or another, the characters could talk much or less, the sound could be loud or quieter, and she mentions many good and bad examples for both! It’s hard to follow her through so many kind of examples. Additionally, the average reader have never seen so many movies. I see and appreciate her enthusiasm, but I’m not really interested in her personal fandom (classical movies) – she would have added some more practical advice instead. The author is a journalist, and at the beginning there’s a perfect sentence about how to write a review. 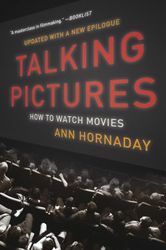 But later the book becomes more of a study than a guide: it has some good points, but it’s hard to decide what to check sitting in a cinema, the book is not practical enough for other would-be-journalists. What I surprised at most, television series are not even mentioned in the book. It’s OK that her personal favorites are made to film (instead of digital formats), in 2D and displayed in a cinema, but television series made such a big effect to the audience and the industry, that it seems a mistake not even mentioning them it a book about movies. But it’s impressive anyway, you can learn a lot about movies, and you definitely will be a better company when movies will be discussed among your friends.